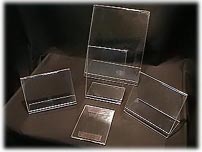 All of our clear acrylic picture & photo frames are made of quality materials and are made to accommodate most standard photos. However, if you should need a special size not listed, please contact us for pricing. All frames are made from 1/8" (.118 thk). clear acrylic material and ready to use. Simply slide you photo between the opening and your done. If you have a special size photo you would like in a frame, just E-mail us the size of your photo or picture by length then width, or go to our quote page for a custom size quote. Brillianize Acrylic and Plastic cleaner. All below frames come 5 frames per box except the wall hanging frames are each price. Custom sizes can be produced if needed. Quantity discount on 25+ of any 1 style or size.